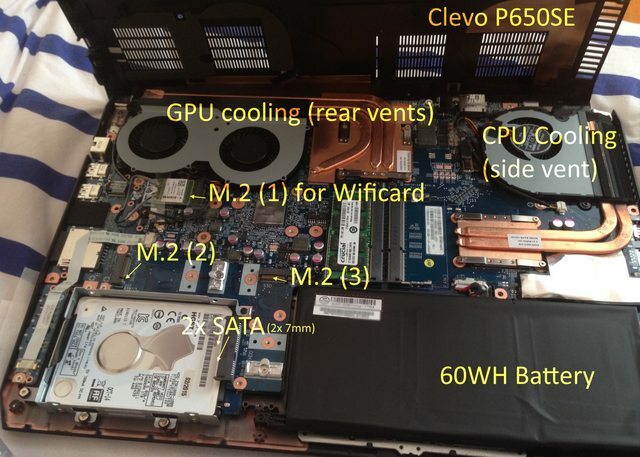 Here's a quick review of my latest laptop purchase- the Clevo P650SE. Any questions about it reply below. •	180W Power Supply (19v 9.5a) (uses non-standard plug- not the clover leaf style). Speakers are good (far superior to the W230SS). Are exposed even when lid closed which is handy. Overall it is a very good IPS screen. Good brightness, and viewing angles are wide. Good Gamut coverage. Screen is the same as the Asus N550JK (but in a Matte finish- which is a must for me as it blocks out glare). For those in Aus, JB sell this model if you were wanting to see the screen before you buy. I considered the 3 or 4k versions- but this was too big a tax on battery life. I’ve heard reports of only just 3 hours on the 4k screen. A good thing to note. •	Screen size (13” vs 15”). This is merely my personal choice. 15.6" feels a world apart from the W230SS. I can actually sit comfortably and use it without hunching over. My W230SS spent 99% of its’ life plugged into a monitor because of this. Keyboard was faulty (spacebar was missing strokes). Very annoying. Reseller sent a replacement. This laptop ticks all the boxes for me. This strikes a perfect balance between portability, looks and power. 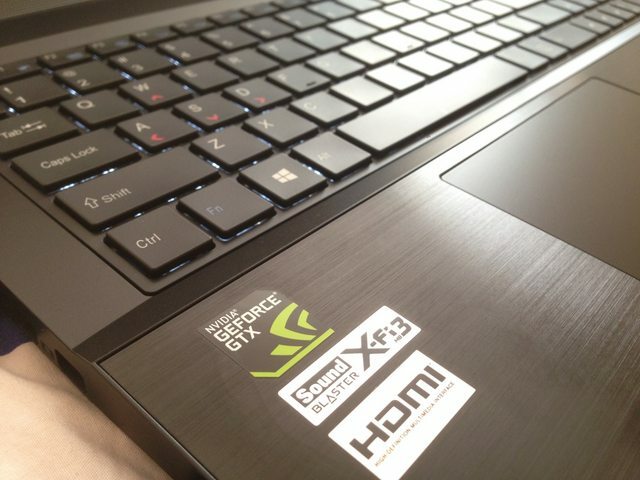 It does not look like the beasty gaming laptop (which it certainly is). I needed a laptop- mainly for work. Looking professional is essential. Work doesn’t confine me to a desk, and I don’t want my laptop to either (thus 15.6”). Doing production work (photoshop, video editing, coding) is a must. And on the rare occasion that I get to game- I want to enjoy it to the fullest. Being portable and getting decent battery life were key factors in my decision. A 3 or 4K screen would have been nice- but not at the sacrifice of battery life. Overclocked the 970M to 980M specs (around 30% OC). Boost by 135MHz (1059MHz) and vRAM increase to 1172MHz (6000MHz). Doesn't get too hot I can report back if there's interest. Battery efficiency (may be controversial)- Using Intel XTU I set a dynamic undervolt of -141mV and multiplier of x18. This kind of undervolt is rare (just got luck with the chip). Batterylife is exceptional (using Wifi, 30% brightness, multiple tabs I am getting ~ 5-6 hours [I will update once I’ve used it a few more times]). Clover boot loader installed and running a multiboot (OSX Yosemite and Windows 8.1). Will report on this if there’s interest. In conclusion, this is a very hard laptop to fault. It encompasses a huge amount of power in a small, neat, practical, and small package. At ~2.5Kg (including built-in battery), and at about 2.8cm thin- it really makes you wonder why Alienware/MSI get away with such chunky/ugly/thick machines. I'm very comfortable taking this around cafes, uni and work especially with its subtle look. The added security features are a nice addition. Biometric scan (such as to log-in) and the TPM chip add yet another layer of security to your data. Don't like the branding on the lid? Carefully apply Acetone with a cotton bud to the printed on text and it will remove it very easily. Battery maintenance. As it's no removable, there's no way to limit between 30-80% to reduce wear on the battery as I normally do to maintain a heathy battery. I've heard others say you should totally discharge the battery to 0% once a month to keep it healthy. Can anyone clarify? My bios loads really slowly (takes while to get to operating system). Has happened since I changed from a single partitioned MBR to a multi-partitioned GPT drive. Could be because of my drive (X110) or because Clevo doesn't like multi-partitioned GPT drives. Any ideas? 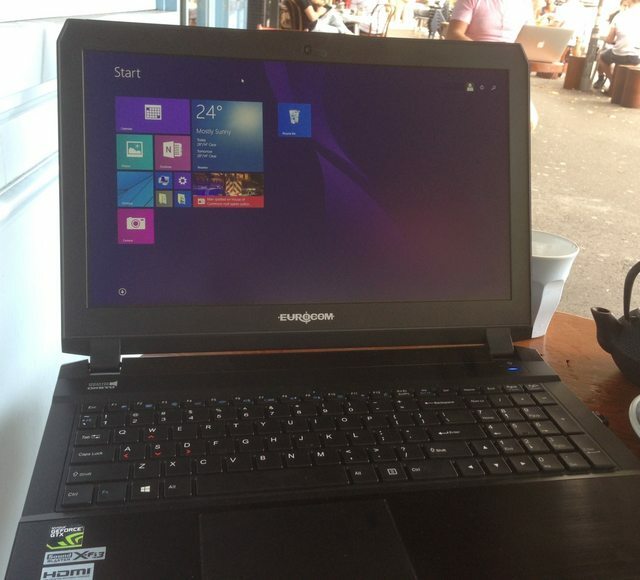 I am currently looking at the Eurocom X3....the slightly bulkier (about.7 inch) cousin. I am interested in your temperatures though, do you actually have temperatures in benchmark readings? Do you mean temperatures of the CPU and GPU? This is the only real 'bargain' 970m gaming rig in Australia. We have a great reseller (www.metabox.com.au) who I have bought from previously. I've just a little burned by Clevo after buying a P157SM (w/ 780m) a few years ago. My god was that thing loud. Sounded like a rocket ship taking off. With an extension cord I could use it to blow the leaves off my yard. I would have bought the skylake version of this machine, seeing as I think it looks great, I know they are excellent quality, and the 970m is fantastic. But in the end decided to go with a cheaper, slightly larger Inspiron 7559 with a 960m, just because I thought it would be quieter (we'll soon see if that's true!). That's the problem with laptops (and why websites like Junky's are so great), it's really hard to compare laptops unless you have them both in front of you. Especially system noise - we all know, based on a computers specs, roughly what its capable of. And we can usually go to a store and try out the keyboard / display in person. But it's not so easy to boot up a game and hear what the damn thing sounds like without too much ambient noise in the background.